Inferior quality materials and poor workmanship could leave you, your loved ones and your property vulnerable. The BSI Kitemark™ is a registered certification mark owned and operated by BSI. It is one of the most recognised symbols of quality and safety and offers true value to consumers and businesses. What is TS007 Kitemark? To effectively protect your door, the lock cylinder and door handles on your entrance doors should meet the highest standards. Secured by Design and Sold Secure Diamond Approved. Are two more markings to look for offering you piece of mind that the products used meet the standards required by a test body independent of the manufacturer. How to achieve these standards and levels of security. Or using a one star cylinder and a two star security handle. 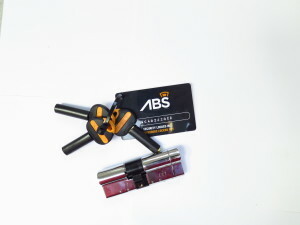 The handle shields the cylinder behind the back plate giving access only to the key slot. This unique profile protects from mole grip attacks.